When you hang out with sketch artists..
a) You always get invited on Sketch dates. And it’s pure joy. More often than not, the location is exotic and even if it isn’t, you have great company and even if you have great company you aren’t obliged to socialize, make small talk or mingle. Misanthropes fit right in. You get to sit in your own little corner, do your own little thing, talk as much or as little to the next person and it still doesn’t affect your chances of getting invited again. 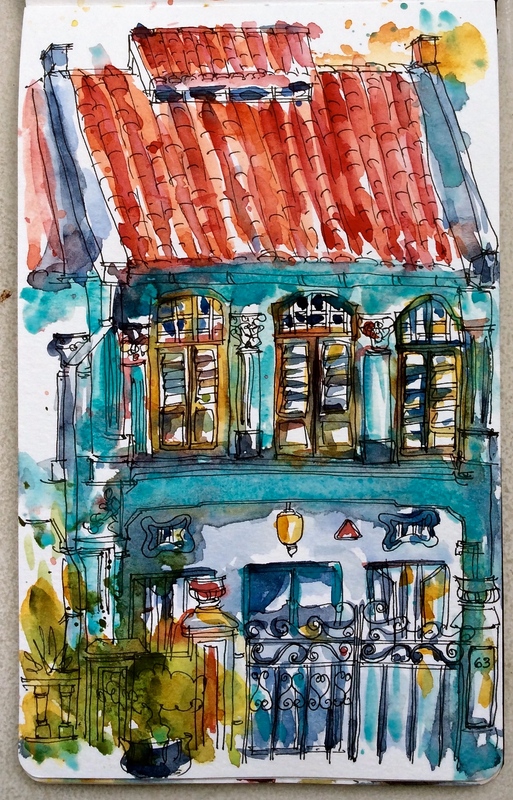 Last week’s location was Emerald Hill, right opposite Orchard Central and undoubtedly one of the most accessible and prettiest places in Singapore with rows of exquisitely conserved pre-war terrace houses turned into business establishments and homes. It is really hard to be not inspired here. Even though our path and enthusiasm was marred with a veritable rainstorm (for it is the wet season) the show went on as you can see from this fruitful harvest! Each one of us left feeling inspired, contended and with promises of future hangouts. A dainty blue shophouse at Emerald Hill. This looks really well as my iPad wallpaper! b) You order food that would render well in a drawing. Colours, shapes, sizes take precedence over taste. And most importantly, right after the food arrives at your table and the tantalising smell starts flirting with your senses, you are able to exercise monastic restraint in choosing the fork over the pencil and an inimitable ambition to finish sketching before the food gets cold and/or your dining companion starts fidgeting. After my sketcher friend finished placing her order at Sakae Sushi, she turned to me and brightly declared, “The Salmon and Tuna sashimi..aren’t they colourful?…I ordered these, coz they’d look wonderful in our sketchbooks”. I might have teared up a little. c) You get programmed to see ‘interesting’ things wherever you go, in the most unassuming places and at all possible times and want to document that. 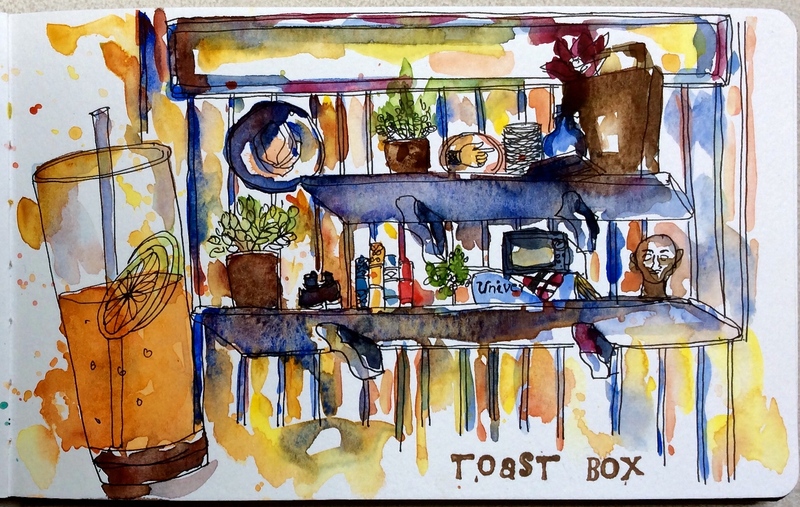 Only because I was with a sketch artist, did I take away time from my honey lemon juice to join her in drawing this bunch of vintage items exhibited at Toast Box – a ‘reflection of coffee shops in the 60s and 70s’ – as part of their decor. I walked away knowing every item on those two shelves and the ones I liked the most – the palm sized TV and a pair of antique looking (or antique) binoculars. Probably this information won’t serve me a great purpose but when I was there, sketching, I wasn’t thinking of checking my phone, answering emails or figuring what to cook for dinner. I was involved and emotionally invested in what I was doing. It seemed like a therapeutic exercise in mindfulness and left me richer than anyone walking off with just the taste of that overly sweet honey lemon drink. 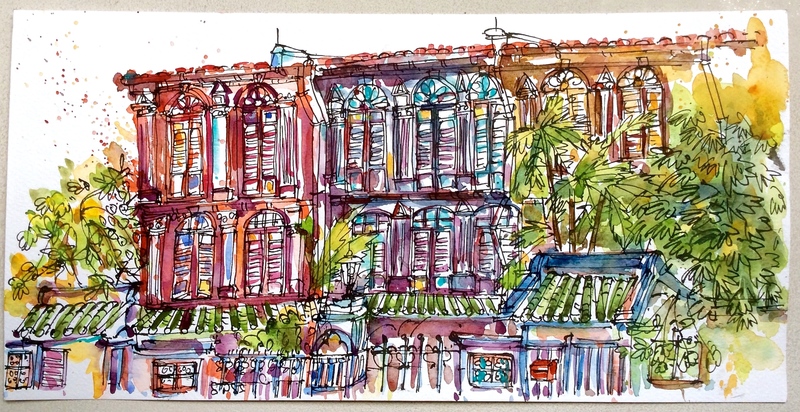 This entry was posted in Daily Vignettes and tagged artists, drawing, Emerald Hill, illustration, Orchard Central, orchard road, Sakae Sushi, Shophouses, Singapore, sketching, terrace houses., Toast Box, urban sketching, Zen on December 9, 2014 by Somali Roy.